You come across stats from time to time about IKEA - the huge numbers of people who sleep in IKEA beds etc etc. Well I can safely say that at least 80% of my friends own an Expedit shelving system (especially those with small children). 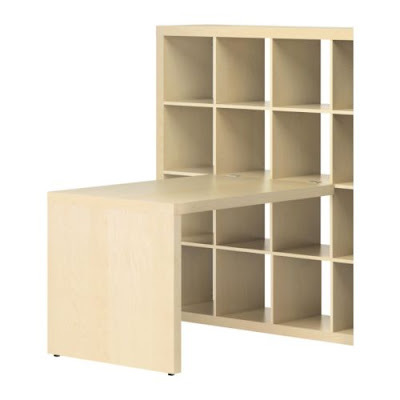 I am thrilled to see this new desk attachment as we are about to move ours from the living room to one of my sons bedrooms and this little desk (top is 115 x 78 cm) is perfect for them. I am assuming you can attach it to any point on the shelves - mine is a 5 x 5 but will be racing off to confirm soon. PS: its AU$129 - how could you go wrong ? Last week at my design course one of our teachers who is also a well known stylist talked to us about how layering and texture can really bring a room to life. 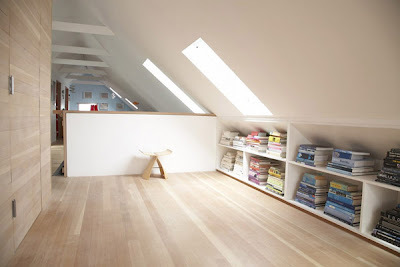 So many rooms are perfectly finished but end up a a bit soul-less and 'done' looking. 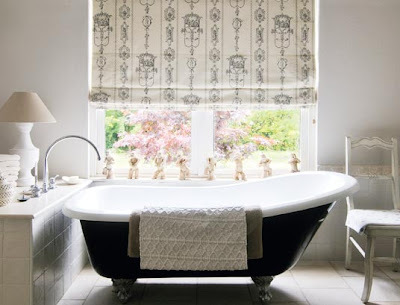 This bathroom is still very functional but the choice of blind, towels and accessories make it very inviting. 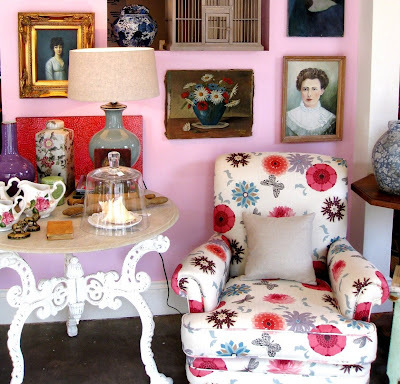 These pictures were featured on Apartment Therapy recently - I absolutely love the painting - its scale, colours, concept, all of it. From the write up it was painted about 40 years ago. 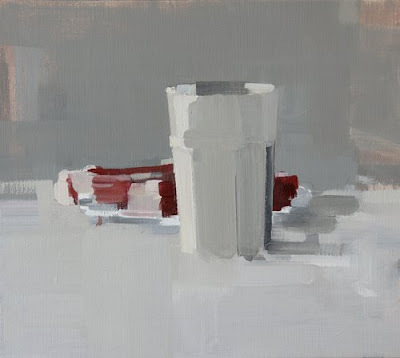 I am studying for a diploma in interior design at the moment and this term we have done a lot of work like this - albeit on 2 cm x 5 cm chips of paper. But still its got me thinking . . .
Usually I am pretty good at keeping a record of the source of the images here but for this one I have unfortunately lost its provenance. 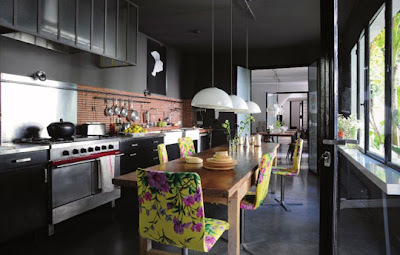 It is a bit different this kitchen - dark walls, the big industrial looking surround on the extractor hood and the contrast with the beautifully upholstered and cool chairs. You don't often see such a dark floor in a kitchen either. I have been squinting at the picture to determine if the house just goes on and on as it seems to extend to another long table and then to another and another set of doors. 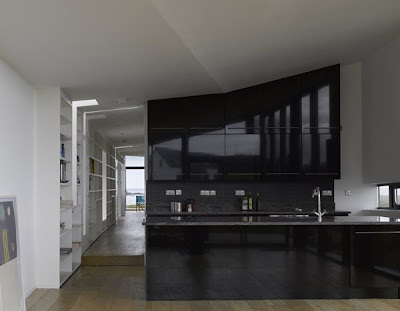 Intriguing and I really like the kitchen. 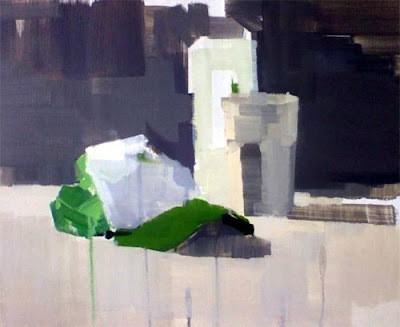 I had bookmarked Stefan Dunlop's site some time ago as I liked the Explorers painting at the bottom. 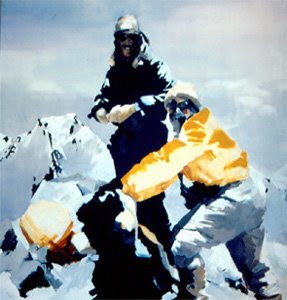 For no real reason ( I am not a mountain climber ) I devour books about Everest and those who attempt and fail to climb it and so am familiar with the photo Explorers is based on. 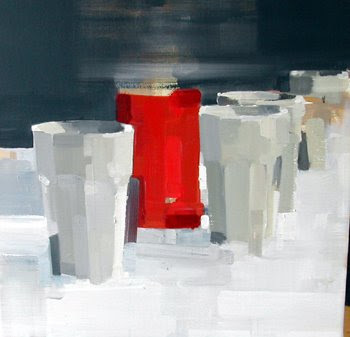 Anyway the first painting 'T-bonecup' below was featured in Inside Out this issue and I went back for another look and have picked out a few favourites. I love the greys, the splashes of red and green and the deep purple background the the third painting which is entitled 'Capcupbottle'. 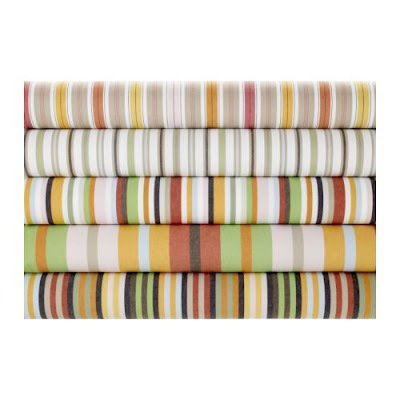 IKEA does some lovely striped fabrics at great prices - $12 -15 per m. I noticed the Elisabet range has come out in a whole new range of colours. The fabrics shown below are the 'beige' range. There is a pink colourway but the photos online aren't so great. Must take a trip to check them out. 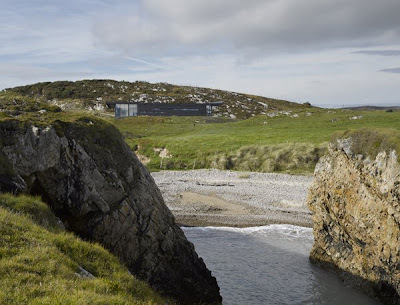 A number of blogs I follow are covering Irish design this week which is lovely for me as being so far away it is hard to keep up to date with everything thats happening in Ireland. 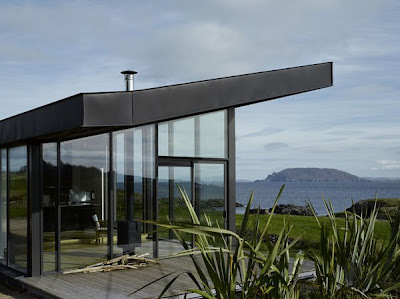 This house was featured by Apartment Therapy and I hadn't seen it before. 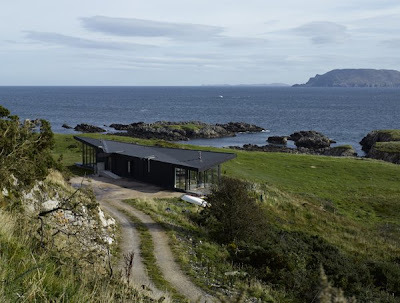 Tuath na Mara is on Lough Swilly in Co.Donegal and is a prize winning design by Mac Gabhann Architects You can see why from the photos below. 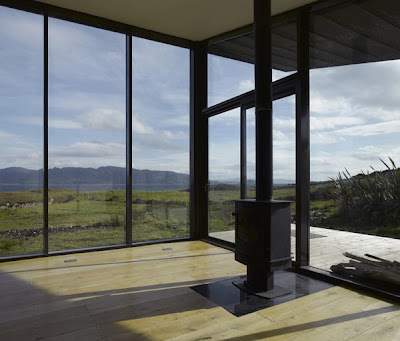 Its incredibly sensitive to its surrounding environment while offering its residents stunningly framed views from all angles. 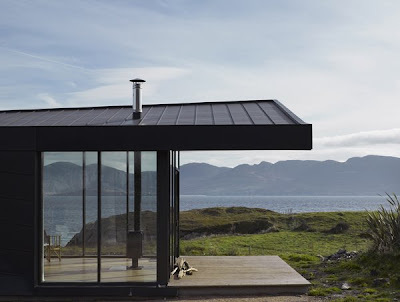 Yes, another for my 'if we ever build a holiday house' folder ! It is St. Patrick's day today and being Irish I thought I would share something from my home town to mark the occasion. Now, for most Irish people being Irish has very little to do with the global frenzy of green beer and diddly-i-music that takes hold in most major cities on St. Patricks day so I hope the lack of leprechaun hats and green type does not disappoint. 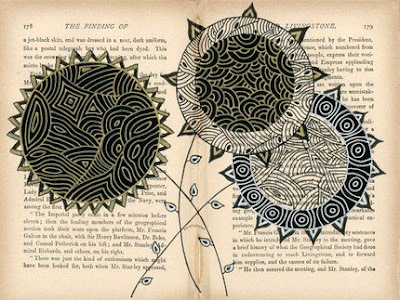 These 'altered book pages' as she calls them are by Iris O'Connor who is based in Dublin. 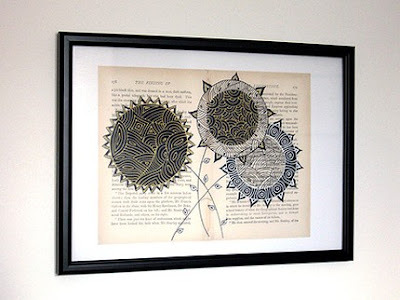 She works in mixed media and saves and reworks old book pages. 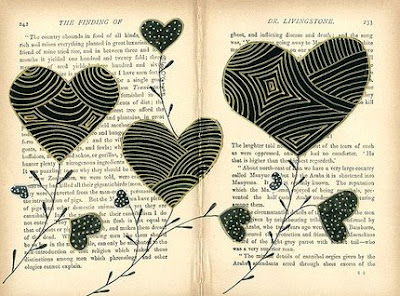 I think they are very original and would look great in a study or library or anywhere at all really. There is lots more of her work in her Etsy shop here. 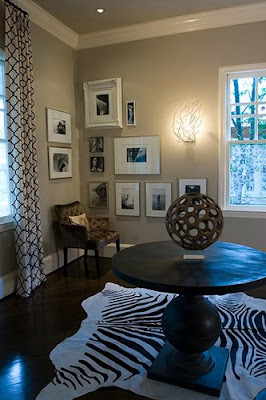 I am always on the look out for innovative photo layouts like this one as my house has lots of nooks and corners like in grave need of some time and effort to make something of them. I like the triangle layout and the way the two pictures on the other wall are lined up to its middle. The obsessive compulsive in me would have to line up the bottom of the pictures along its base though . . 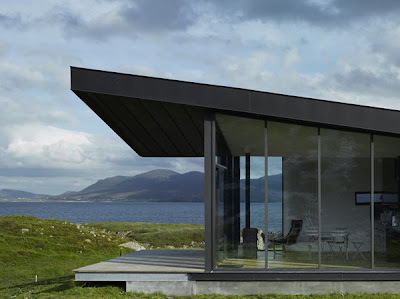 Still contemplating ideas for our study - to go dark or not that is the question . 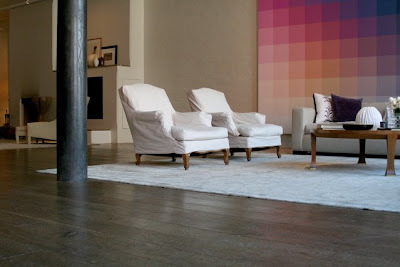 . . My house is all painted an antiquey white and while the neutrals are lovely I am itching to differentiate some rooms. 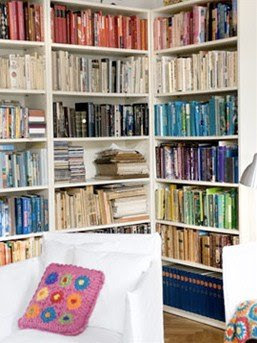 But I also want to able to work in the study - so how would the light feel if I put in dark bookshelves. The debate continues. 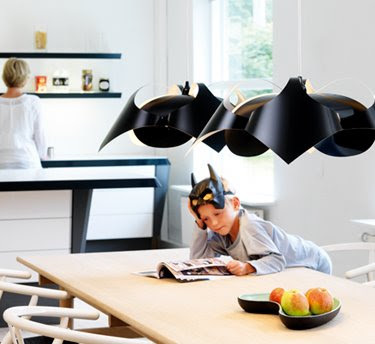 For the little (or big) superhero in your life this is 'the Joker' by Le Klint from Funkis. It is quite big - 50 cm diameter but very sculptural lit or unlit. Designed by Christian Raeder in 1970 it does make you think of a pack of cards. I am working in sequence this week. Going through Sam McAdams portfolio yesterday I spotted this shot which includes two things I had bookmarked for inclusion here. When you look at my home from the end of the garden there is one area of blank wall which is crying out for some sort of adornment. 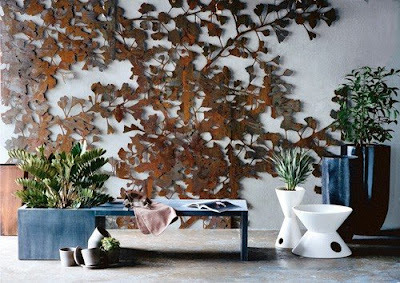 Plants of course are an option but I like outdoor art and have my eye out for something along the lines of this beautiful Ginko screen by Kif + Katast. The screens are made from laser cut steel and rusted 'on purpose'. They can be hung both indoors and out. The second thing is the bench. 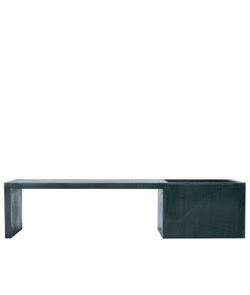 This zinc bench is the In/Out bench by JF Dors. It can be used as a planter as shown or for a little outdoor water pool, or if you are really not into gardening at all as an icebucket for parties !! In Sydney you can get the In / Out bench from Parterre. I am surprised with myself that this is the first time I have included a Florence Broadhurst design on this blog. This is Centrepoint Medallion in Ink Blue on Flat White from www.signatureprints.com.au again spotted in this month's Inside Out. 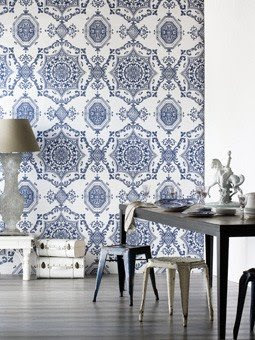 Florence Broadhurst was a very interesting and talented Australian woman who led an adventurous and chameleon like life ultimately establishing a very successful hand printed wallpaper business based in Sydney. 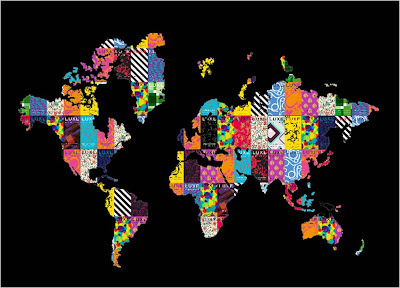 Signature Prints are the curators of her wonderful designs and many are in production today. You can read a bit more about her daring and dashing life on their website. "A Life by Design' by Siobhan O'Brien tells her life story and is also a very good read. I read recently that a number of new patterns had been discovered - maybe this is one of them. I love the really dark navy in this print and the fact that the pattern is hard to pigeon hole. I finally got to sit down and read some of my newer magazines this weekend and found a lot to enjoy and store here on Folder of Ideas. 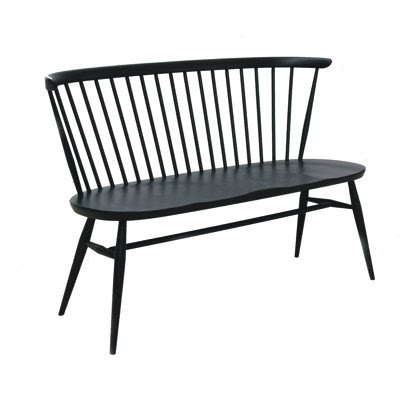 First up - via Inside Out, the fabulous Loveseat in black from Ercol. 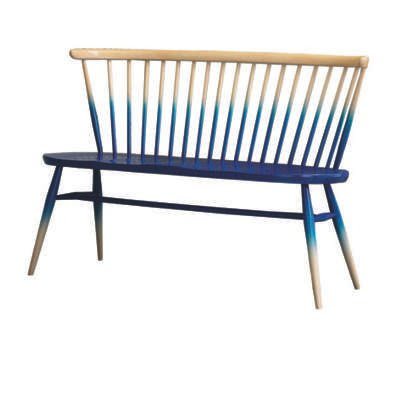 Ercol has released some of their popular classic furniture in black and they look great http://www.ercol.com/ . I have a bit of thing for nice benches and the Loveseat is so elegant it would grace any space. There is even a partly painted blue version for those still loving ombre. This upholstery fabric is a favourite of mine. The picture is from Anna Spiro's shop Black&Spiro. I think it is by Osborne & Little from a few years back - must email them to find out. 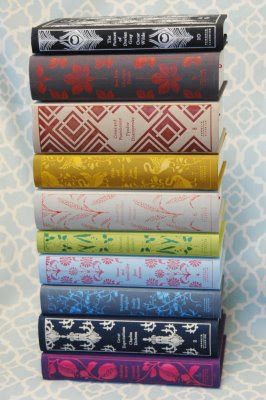 It is my turn to host book club this evening so I thought why not post my 'books by colour' collection. I am not sure why but this look has come up in a number of different magazines I read - is it a trend - not sure. 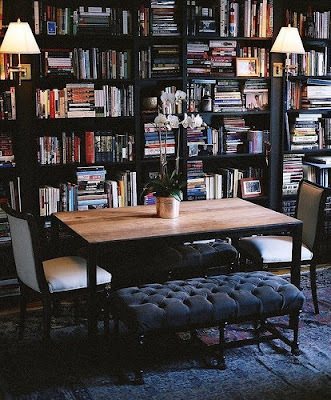 I love books in a room but and like everything else in life, it takes a little bit of work and ongoing attention to keep them looking good. I am really enjoying Little Green Notebook at the moment which is where I got these shots from. 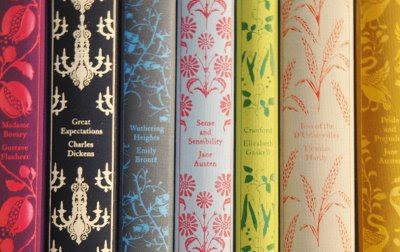 These divinely decorated classics would give any bookshelf a major facelift. 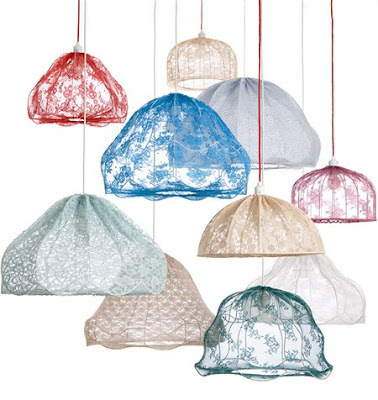 These lampshades are Mollerlamporna by Kicki Moller who is based in Stockholm. I am an avid Desire to Inspire reader and it was through one of their recent reading lists that I found Design Shimmer and these shades. 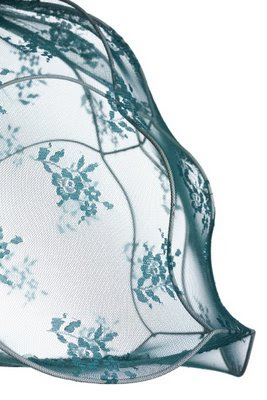 The lacy shades are a little bit knickerish but pretty all the same and I particularly like the minty green one and the cream shade beside it.